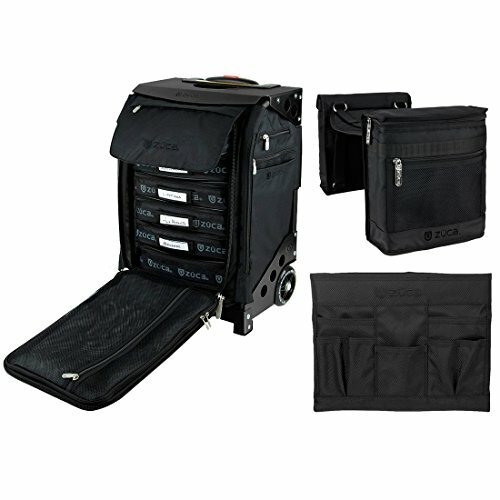 The Zuca Flyer Artist insert bag features 5 utility pouches and a matching travel cover. The pouches slide inside the insert bag easily and let you organize your supplies and other essentials, thanks to built-in labeling. The exterior of the insert bag is constructed from premium, heavy duty, 1000D ballistic nylon and is coated with water resistant polyurethane. So it can withstand the elements and protect your belongings. It's also removable and hand-washable! The aerospace-inspired aluminum alloy frame is designed to be light enough for travel but is strong enough to support up to 300 lbs. So you're never without a seat when waiting for a flight, bus or train. It's held together with custom, rust-resistant, chrome-plated screws that have shake-proof nylon aircraft lock nuts. The bottom of the frame features 2 feet and 2 wheels. The 4-inch polyurethane wheels absorb shock and are whisper quiet. Being recessed, they make for storage in overhead compartments easy! The feet are made from nylon 6, which is easy on scratchable surfaces but tough enough to resist grit & gravel impregnation, which can tear up wood flooring. Strict limitations are in place by the FAA for what may or may not be used as carry-on luggage on flights. You can rest easy knowing the Zuca Flyer meets those requirements and is fully FAA compliant. These wheels also have a cool flashing design with embedded LEDs. They look great and will keep you safe when wheeling your bag at night. Aerospace-inspired Aluminum Alloy Frame - Supports up to 300 lbs.